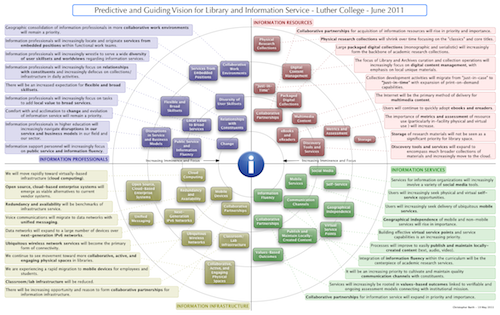 This report is an overview of projects and initiatives from the 2010-11 academic year for Luther College Library and Information Services (LIS), an integrated information service organization serving the faculty, students, and staff of Luther College. This document was written by the staff of LIS in early summer of 2011 and was prepared and published digitally for the web. The organization of the document is structured on our goals and objectives for the 2010-11 academic year, which are individually presented and discussed. This structure intentionally cuts across library and information technology structures to demonstrate the integrated nature of our information support. A brief snapshot report is also available. For more information about Luther College Library and Information Services, visit https://www.luther.edu/lis/. This annual report was published June 24, 2011 and was written by staff of Luther College Library and Information Services. It is the synthesis of many individual and departmental reports covering work completed during the 2010-11 academic year. Projects that are strategic in nature are broken out as specific objectives and mapped to our organizational goals. Work that reflects our ongoing initiatives in support of the mission of LIS and the College is included in our team reports. It is something we do everyday, whether we acknowledge we are doing it or not. We make value judgments. Each of us manages daily a defined pool of resources: money, time, or perhaps most precious, our attention. Our days are filled with small but significant decisions that define the value of the things in our lives – services, tools, places, people. Increasingly it seems more and more things are competing for these scarce resources. The value judgments we make therefore carry more importance now than they ever did. The things in which we place value change as we change, and evolve as our needs evolve. This is true both on a personal level as we progress through the timeline of life, but also as a society and culture as we continually grow and adapt to the world around us. Progress, innovation, and change do happen and this is a good thing. That these things change and affect our value judgments is not inherently a good or a bad thing. Yet somewhere we must take stock of where those judgments lie, not only for ourselves, but also for those we serve. The topic of value has been in the national discussion of information service this past year. The Association of College and Research Libraries issued a report looking at how value is defined for academic libraries. It includes a call for libraries to better understand and articulate value in the future. OCLC also released an update to their Perceptions Report which looks at how users of all types of libraries value and perceive the services they provide. In a similar vein, Inside Higher Ed published a survey of college and university presidents on their perspectives of the value delivered by information technology to their campuses. These are a few of the broad professional studies touching on the topic of value in information service. Locally, we have also been a participant in the MISO (Merged Information Services Organization) survey which gives us a picture of the value our local community places on our services. I’ll put it bluntly: the times are changing. The perceived value of libraries is clearly declining across these studies. Historically, libraries were the only place to go for information. No one individual could afford to collect the resources a library held. Therefore they held significant shared value. Today, the Internet has fundamentally changed this equation. The very thing that most people valued about the library — access to information – can now be found elsewhere at a seemingly lower cost. There are no tax dollars that get paid to Google. The value in the other services a library provides such as information literacy training, access to rare and unique materials, research assistance, and physical spaces are not the things most associated with the brand of the library (the OCLC report examines this question closely). The future of ebooks is being made today by large companies who have little incentive to make use cases easy for libraries. Consider the effect on libraries if Amazon.com instituted a Netflix model for ebooks delivered to mobile devices (Kindle, iPad, Nook, etc.). Consumers could pay a flat rate of $9.99 per month for access to a set number of titles at a time from a seemingly unlimited catalog updated daily. There is nothing technical that would prevent this model from working today. It is clear that historically, library users value the collections. Going forward the collections will no longer be as unique nor defining. We in the profession must work to ensure that libraries are known for much more than just collections. It is somewhat paradoxical that in today’s age of technology innovation, information technology organizations are facing similar challenges. It is true that any organization of significant size cannot function without technology infrastructure today. Just walk around a modern workplace during a power outage and note the dazed looks on faces. In most places, business processes are digital and rely on a wide range of tools to function. Leaders, and in our sector, college and university presidents, however, are not certain of the value delivered by all this infrastructure. The costs of providing IT are in some ways divorced from the business processes they support. The fact that technology operations remain a somewhat mystical and unknown science to many in leadership positions exacerbates the problem. There is a trend in many areas of IT to deemphasize the technology organization itself and instead infuse it within the other business operating units. I think this is a good direction as it better paints the picture of how technology delivers value in the real world. The rise of cloud and virtual computing also is disruptive to technology support in the same way the Internet was to libraries. There is no longer a strong business case for much local IT infrastructure as servers in the cloud are cheaper, and often more reliable. As personal devices go more mobile, and everything is network based, the role of organizational IT changes significantly. The value of our local infrastructure (or collections in the library case) is lessened. Are our IT organizations known for delivering value in other areas such as training, integration, and user service? Our first hurdle to overcome is the often distorted view of value that we who work within the information profession have about our services. Our problem is no different than anyone else’s. We have chosen to make a profession providing library and information technology service, and so, of course, we find value in what we do. To be fair the studies above do not say that library and technology services are not valued – they are. However, the things that are valued about our services are not the things that we are in the best position to deliver in the future. So our second hurdle is to rethink and rebrand library and information service in the minds of our users. Focusing on the primacy of our personal relationships with users, we need to double down on our literacy and training initiatives (the need for this is greater than ever even if people do not really realize it). This also involves working to deemphasize portions of our service that have long been at the forefront. We need to fundamentally question all assumptions about how we do what we do. Such exercises can be difficult and scary, though they do not have to be. What we do – providing resources and expertise to support the academic mission of our host institution – has not changed at all. Pretty much everything about how we do that has and should change. We need to hold fast to what we do, and jettison as much legacy “hows” as we can. Keeping this perspective helps maintain focus and allows true change to happen. For if one thing is certain, if how we do what we do does not change significantly in the coming years, we will no longer be relevant to anyone but ourselves. This is particularly challenging in higher education where many of our constituents will not press us to change. We need to have the vision and courage to go where we know we need to be in the future. I have read and heard arguments that the solution to the value question lies in a better articulation of the services we provide. I think this is true, but that it should not be our focus. The assumption in that argument is that our services are worth the message. However, if you have to convince people that your service or product is better than others through marketing, then you’ve already lost the war. What I believe is much more effective is designing and delivering such high quality, useful, and innovative services that users instantly recognize the value and seek it out. Doing so opens up relationships and communication paths through which we can further articulate our message. We can no longer afford to carry forward or prop up mediocre or outdated methods of providing service. We know that today’s consumer also is much less likely to grant multiple opportunities for success to us. Our challenge is to move earnestly and intentionally to a new model for information service. Though the stakes are high, the benefits are many, and in our case of supporting the education of tomorrow’s generation of citizens, the value delivered by doing so will be long-lasting and true. a place to explore and express ideas, ourselves, and our community. The following sections contain the primary content for our annual report. Discussion of individual initiatives and projects are listed under the appropriate goal they support. In many cases particular projects may support more than one goal. In those cases, the primary goal is listed. We will work to understand the mission of Luther College and the work of our constituents. We will understand our place in the institution, and we will adapt our work to respond to the changing needs of the College. On Oct. 28, 2011 a new theme closely matching the main Luther web was unveiled on the LIS website. New additions include an image slideshow on the front page, a slightly revamped menu system on the left column, and easy access to the rest of Luther web via the page header. The search box found in the top right corner of each page now searches the entire Luther web, which includes results from the LIS site as well as the new LISGuides research subject guides. In mid-November, the Luther theme was also applied to the proxy server login page. Next Steps: Evaluate and apply elements of the college web theme, when appropriate, to other LIS websites, including Magnus, Illiad, and LISGuides. Informal research has been done into the scope of access and tools provided by other library/IT organizations. Work on identifying format and specific content of a mobile LIS site will follow the migration to Reason. We have also evaluated usage of mobile applications at m.luther.edu for visitors and students. Continuing work is exploratory in nature, like logging into Katie from a “droid” device with an eye towards developing some initial applications that would set the groundwork for course evaluations to be completable from a smartphone (a request of the course evaluation committee). Next Steps: A number of database and service vendors provide mobile-friendly interfaces (e.g. LISGuides, EBSCO databases). These interfaces should be better-exposed to our users. A project to configure the Magnus library catalog to serve a mobile-friendly version of the search interface was started in April 2011, and is expected to be completed by September 2011. Once more programmers have exposure to the development environment and the programming constructs, the Software Development team will develop a plan for making applications available to the mobile platform that make sense for students, faculty, and staff. In terms of the physical plant, LIS continues to be mindful of accommodations for accessibility as we redesign and renovate spaces. Most recently, we designed an accessible OPAC workstation in the lobby of Preus Library. In terms of services, we continue to work with the Disability Coordinator and the Student Academic Support Center. In support of an ongoing effort to fulfill a federally mandated requirement, a Help Desk student worker collaborated with the Director of SASC to evaluate 14 text-to-speech readers (including Kindles and iPad/iTunes). The project concluded that the systems that SASC has in place, Key to Access and Natural Reader, are the best available for campus use. There could be some adaptations, but overall there was not a replacement that would offer exceptional improvement. Next Steps: Continue to redesign library services and facilities with an eye toward accessibility while supporting SASC and the Disability Coordinator. LIS has implemented a third-party hosted solution for gathering and assessing ideas. This has been in use for LIS for most of the academic year and was also introduced campuswide in spring 2011 to gather community feedback as part of the Task Group 150 work. Other campus units have expressed interest in using the system and can be brought up later this year. This software may also replace the Round Table Room software Facilitate.com. Next Steps: This service will be incorporated into regular LIS services. We will seek to provide appropriate, quality information tools and services to students enrolled at Luther College. Though we prioritize and place our emphasis on the academic information resources required to successfully complete the curriculum, we recognize that LIS-provided library and technology services are important recreational and social services supplementing residential life at Luther. We will seek to engage the student community and to understand the perspectives of students when assessing and evaluating tools and services to ensure they are appropriately meeting their needs. Develop a sustainable and expandable framework for information fluency. Library staff involved in instruction each wrote an individual statement of goals for the year as a way to measure progress towards increased integration in the curriculum. The goals were focused on developing relationships with faculty, departments, and services, and provided a way to shape instruction efforts both for this year and in an ongoing way. The individual statements will be assessed for 2010-11 and revised for 2011-12. All research help content for academic programs and courses was moved to LISGuides (LibGuides) at the beginning of the year, and integrated content was developed specifically to support the Paideia I research unit. Following a program review of Paideia, faculty decided to retain research as an important focus for Paideia I, which will allow us to continue to provide a consistent information literacy foundation for all first-year students. Next Steps: A faculty summer workshop will be offered during July 2011, focused on enhancing student learning with information literacy and technology. These faculty partnerships will carry through into the 2011-12 academic year, as the workshop is focused on developing course assignments and courses that facilitate more effective student learning. Faculty participants will be asked to consider the role of their course in building information literacy skills as part of their major or program. Seven course sites piloted the not-yet-feature-full version of Morsle (integration of “Moodle” and “Norse Apps”). 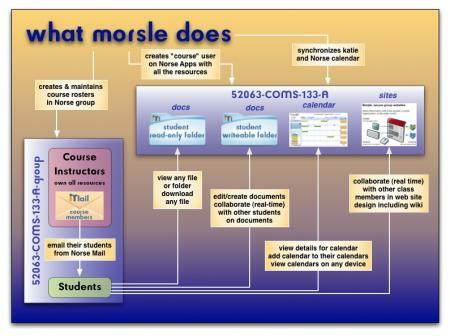 Demonstrations of nearly-full-featured version of Morsle were made to faculty and administrative staff as well as individual discussions with users where Morsle appears to have a very good application. The rest of Morsle’s functionality will be available to faculty on an opt-in basis. Morsle features will continue to evolve as new ideas surface on how katie and Norse Apps can work better together. Next Steps: Steps are underway to adapt current Morsle code to allow for event synchronization between ALL katie course sites and Norse Apps calendars for those courses for 2011FA. We will seek to provide appropriate, quality information tools and services to faculty of Luther College. We recognize the increasing importance that information literacy and technology fluency skills play in the curriculum, and will work to deploy tools and services that support the faculty in teaching and growing these skills in our students. Our focus and priority will be on maintaining information resources and tools that primarily support undergraduate teaching and research. Service Level Agreements record the anticipated needs of academic departments, clarify expectations of LIS and each department in regard to instructional technology, and outline service and support guidelines. During the fall semester, LIS completed the initiative to develop a service level agreement with each academic department on campus, concluding with meetings with Africana Studies, Communication Studies, Economics and Business, Education, History, Library and Information Studies, Political Science, Psychology, and Sociology/Anthropology/Social Work. We also visited with the Music and Nursing Departments as a mid-point check in the cycle of departmental meetings. The resulting documents will serve as an ongoing record of requests and concerns related to instructional technology. Next Steps: Continue the cycle of meetings with academic departments to keep technology agreements current. We held a series of discussions around the integration of new literacies and skills into library and library liaison support. Rebecca Sullivan‘s position has also been shifted toward instructional technology to allow her a more targeted area of pedagogical support, with some broader areas of academic technology support moving elsewhere in LIS. We affirmed the need for broad skillsets among our liaisons and will continue to work toward this. Next Steps: Continue to build and maintain awareness of LIS services as we work to cultivate strong liaisons to academic disciplines. Though there has not yet been a faculty vote, a strong assurance has been received from the committee charged with the next generation of course evaluations that these will be performed on KATIE. Initial planning work is underway to design a “wraparound” that will permit some additional features to be available to katie’s Questionnaire module. These would include ease of adding customized questions, mobile access and automated reporting. Next Steps: A faculty vote is due in August and coding for KATIE course evaluations would need to be complete by late October. Some training would be suggested as only 80% of faculty currently use KATIE and the program would benefit from all faculty understanding how to administer the questionnaire (currently intended to be “in-class”). We will deliver the best appropriate resources available to us to allow our users to succeed academically and professionally in their work at a liberal arts college. We will work to continually assess and improve the research tools and technology infrastructure that comprise our strategic information resources. Resources for academic research resources remained steady for this academic year. Slight reductions were made proactively by LIS to departmental allocations based on actual spending history and to recover some resource to apply toward new initiatives in information fluency programs. We continue to note the ongoing increases to license and purchase costs for materials and have continued to work to protect the academic resource budgets as strategically important to our academic mission. Next Steps: Continued work will focus on protecting academic research resources and improving budgets where possible. Resources for technology have also remained steady this year, though we note a slowing down in the growth of hardware capability. As a result we are continuing to evaluate refresh cycles and the maximization of our current workstation inventory. We are also approaching this with a recommendation to significantly reduce campus lab infrastructure over the coming years which will involve a new examination of resources for workstation support and refresh. Next Steps: We will continue to monitor and adjust refresh cycles where and how appropriate (faster or slower). Increasingly one size will not fit all cases. We also are moving forward to actively and significantly reduce our overall inventory of workstations. New servers and Microsoft SQL Server database are being ordered, Datatel’s port fee and contract will be signed soon and we have an estimate of the consulting services needed to complete the project. Project will start in June 2011 and is estimated to take 12 months. Next Steps: All current customizations and reports will need to be evaluated with the help of the end-users and modified as needed. Significant progress was made towards this goal in a number of ways. Once again we reviewed our print journal subscriptions, converting 26 print titles to electronic only access for 2011. 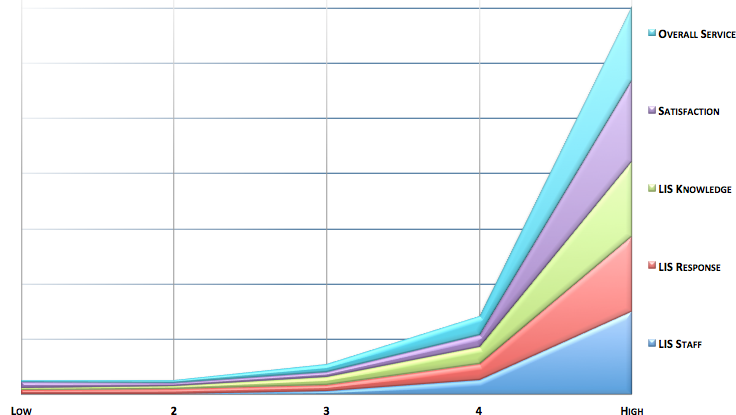 In the spring we identified another 47 titles to convert in 2012. We also began a trial patron-driven acquisitions program based on interlibrary loan requests for recently published materials that meet certain guidelines. This program resulted in the purchase of over sixty books and six DVDs. In addition, near the end of the spring semester we contracted with Ebrary to provide access to over 50,000 recently published ebooks from academic publishers. Several important scholarly ebook ventures were announced in 2010-2011 and John Goodin spoke with representatives of JSTOR, Project Muse, EBSCO and others at the 2011 ACRL conference. The year 2012 promises to be of special interest as a number of these ebook collections become available. Next Steps: We will continue to work towards finding the right balance between “just-in-case” and “just-in-time” collection development by keeping a close eye on emerging digital opportunities while also adapting current practice to better reflect new developments. Several vendor hosted solutions were evaluated, but we haven’t yet implemented one of them. We will build strong relationships with peer institutions and peer networks to become better aware of the state of our profession, to gather ideas and learn skills from our professional colleagues, and to share the expertise of our staff with others. Kuali, open source enterprise software, is making progress in the financial module for the large universities developing it’s functionality and Software Development will continue to monitor progress for the small college functionality we desire. LIS has proposed a TG 150 initiative that also includes examining proprietary desktop software packages that may have open source alternatives as a potential cost-saving mechanism. Next Steps: Continued review and adoptions as appropriate. During the fall semester, recruitment for the Project Cataloging Archivist resulted in hiring Sasha Griffin, who began working on the project in December. During the spring semester, the team created a test version of Archon and populated it with completed inventory spreadsheets and collection descriptions for six record groups. Additionally, Sasha created a project blog documenting the grant’s progress (http://journeystoamerica.blogspot.com) and organized the first regional Archon user group meeting, attended by more than 30 Midwest archivists. LIS also cosponsored a DACS/Archon workshop with the Society of American Archivists, bringing in archivists from around the Midwest to Luther’s campus. Many professional development events were arranged, including workshops, conferences, and consulting visits. Sasha submitted a presentation proposal, which was accepted and will be given in June. Additionally, many steps were taken this year to advocate for and publicize our project and the NHPRC to Iowa Senators Grassley and Harkin. Decorah Metronet: We have continued to work with partners in this project (City of Decorah, Decorah Community School District, Winneshiek County, Winneshiek Medical Center) to plan for the construction of a jointly owned fiber-optic network. Decorah Community School District: We have held initial discussions with the school district to consider opportunities for further information-related collaborative activities. Area CIOs: IT leaders from northeast Iowa, southeast Minnesota, and southwest Wisconsin have met to begin to explore opportunities for greater information sharing and collaboration. Iowa ACM Libraries: The library leaders from the four Iowa schools in the Associated Colleges of the MIdwest have met to discuss moving forward some shared initiatives. These build upon our previous collaborations with the University of Northern Iowa (The Postville Project), Vesterheim Norwegian-American Museum (Journeys to America), Reason (Carleton College and others). Next Steps: We will work to continue to advance these collaborative initiatives in the coming year. We will strive to provide simple and effective products tools, and services for our users. We will value their experience and perspective, while focusing our efforts on enhancing their workflows in meaningful ways. Our products, tools and services should not get in their way, but should allow them to accomplish their work more efficiently. Software Development and Network and System teams have been working together to test Security Assertion Markup Language (SAML) for the ability to sign on once to gain access to Norse Apps and KATIE. A landing page design has been created and testing is in progress to seamlessly transfer between the KATIE and Norse Apps applications. A logout page is also under development giving a user the option to return to Katie or Norse Mail. Next Steps: Our group expects to bring this new functionality live in mid-July. Additional systems may be added in the future when possible. The Podcast Server has been implemented allowing for the ability to capture lectures and seamlessly publish the content to any specified course / courses in KATIE. The Podcast Server has also giving us the capability of streaming live events across campus. Next Steps: Draft and define a policy so we can move out of the pilot phase and offer lecture capture campus wide. The KBOX help desk module will replace the Track-It! help desk functionality. The migration process for existing work requests will allow open work requests to transfer to the KBOX with most of their information. Go live date is June 1, 2011. LDAP authentication is in place and pulls of information from LDAP occur on a nightly basis. This means Norse Key usernames and passwords allow login to the KBOX help desk module which will be particularly beneficial once self-service is brought online for the Luther community. It also means faculty, staff, and student directory information will remain current in the KBOX help desk module. Next Steps: LIS Staff will update migrated work requests, documentation will be written, and staff will be trained on the new workflow using the KBOX help desk module. In addition, self-service will be implemented which will allow the Luther community to submit their own work requests to LIS. On January 5th, 2011, there were changes to our Norse Apps account infrastructure that allow access to other Google services beyond the core suite of messaging and collaboration apps. This change lets users access many new services such as Blogger, Reader, Google Voice, Maps ,YouTube, SketchUp, and Picasa Web Albums from their Norse Apps account. Next Steps: For next year, each course will automatically have a Norse Calendar created as part of our Moodle/Norse Docs integration. Cloud-based Conference Management software, from Symplicity, will be used this summer to support the residence hall housing needs for summer camp and conference participants. Research and testing Google’s calendar application continues to evaluate the import, export, and notification features to support facilities scheduling. Next Steps: Research and contact other institutions using Google calendar to schedule facilities. The majority of all Luther web content is in Reason. Plans are underway to move the LIS site to Reason as well by the end of this summer. The Campus Directory is ready to deploy in the Reason system providing basic information to campus visitors and secured access to additional information for the campus community. Next Steps: Additional Reason functionality for LIS site components will be developed over the summer. All mass-email senders on campus have been setup and trained to use DaDa mail, Norse Groups, Datatel communications management, or are using Constant Contact or other audience-specific solutions. Next Steps: The long-range goal is implementing customer relationship management (CRM) software that we will be researching for use in Admissions and Advancement, Sports, Music, and other offices. A customer relationship management solution will provide users more options for personalization, shared information, and coordinated communication from Luther College. The SSID LCGuest was created to provide easy to use network access for guests. For most of the 2010/2011 school year it has been available in those buildings where the existing wireless network equipment supports it. Next Steps: During the summer of 2011 older wireless equipment will be upgraded and LCGuest will be available everywhere on campus. We will value and pursue original innovative thinking in our field and will continually seek to develop a better user experience for our community of users. We seek to make systems better for our users and not just change things for the sake of change. Following a November 2010 conference offered by the ICPSR on digital preservation, this project has focused on developing a three-phase preservation plan. Also, during Spring 2011 a test instance of the Fedora Commons repository was installed, and connected to a test end user interface served by Islandora/Drupal. Next Steps: Finishing the preservation plan and submitting for departmental feedback. Trialing the ingestion process via the Islandora interface, for storage of college documents. We have maintained the Google search appliance with security updates. We started some research and testing to use universal login and configure network shares, but this work is not completed. Next Steps: A decision has been made to use Google’s site search in the coming year. This is a complicated project that will need to be implemented carefully. Planning has begun, but IPv6 has not been implemented yet. It is much more difficult for us to implement IPv6 when none of our ISP’s are able to support IPv6 connectivity at this time. As we plan, we hope that our ISP’s will soon be able to offer IPv6 Internet connectivity. Next Steps: Continue looking for opportunities to work toward making IPV6 available on our network. The LABStor Shared Virtual Computing Lab is currently in the ‘Proof of Concept’ phase and is being tested by members of LIS, as well as the other schools participating in the venture. Software licensing compliance issues are being researched by LIS. Next Steps: Continue testing and determine if we continue on with the project past the ‘Proof of Concept’ phase. For servers running the open source web caching software squid were deployed during the summer of 2010. Next Steps: This item is complete. Changes were necessary to our existing workstation login system because it was not compatible with Windows 7. We evaluated whether we should update our existing Samba/LDAP based system to support Windows 7, or moving to Active Directory. It was decided to upgrade our existing system with a new version of Samba. Next Steps: This item is complete for now, but a move to Active Directory may still be a future step that we wish to consider. The popularity of tablet computing has taken off in a way that few would have expected. The Apple iPad is by far the most popular model sold, and it does serve the needs of many users very well. In addition, 4 iPads were added to the pool of equipment available at the Circulation Desk in Preus Library for check-out by faculty and staff. iPad Basics Training documentation was drafted and is available at https://www.luther.edu/helpdesk/ipad/. Other vendors are getting in the tablet game, as there are many seven and ten inch tablet models to choose from. Many are using the Android OS, a few are using Windows, and Google announced the availability of the Chromebook. Perhaps a Chrome tablet may be in the works? The cost of these devices is still high enough that buyers think twice about their purchase, and it is hard to find a serious iPad contender at this time. Next Steps: A set of iPads has been purchased for use in the classroom setting and for ad hoc training and instruction sessions during the 2011-12 academic year. Click on Digital Signage to view images related to this project. Cafeteria – A new 46 inch flat screen was installed near the exit door of the cafeteria and now displays information content inputted from Dining Services. Regents Center – During July of 2010 a new flat screen was added to the Lobby of the Regents Center so that they could display Luther sports and news related content to public. Career Center – A new digital sign was placed outside of the Career Center for use by them to display their content. Union Lobby – Both Union TVs were upgraded to new 46 inch displays. The left TV displays our local Luther College information channel and the right TV displays Digital Signage for our Marketing Department. Olin Lobby – Olin received new digital signage that replaced the previous signage equipment. CFL Lobby – We installed a new digital sign in the CFL Lobby. In addition, a professional grade digital signage server was installed to handle to the new demand for these services on campus. The server is housed in the server room in Main. Our local campus channel (now 17.1) was converted to Luther’s first HD channel, allowing us to display more information on our digital signs that operate off our CATV System. A great deal of effort went into the design and branding of our campus signage so that our digital signs would feel attractive and alike throughout the campus, while still displaying unique messages in the spaces they are located. These efforts were led by Christopher Barth, Diane Gossman, and Rob Larson. Next Steps: Digital signage has been requested for the Jensen Lobby and also for the Koren Lobby. This project will result in attaching QR codes to archival boxes that will link users to the online Archon catalog. An iPod Touch was purchased, QR codes were generated and tested, and box label templates were created. The remaining portion of this project is on hold until the Archon catalog is finished. Once the final product goes live, we will have the URLs for each box and can begin generating the new QR-code box labels. Next Steps: Finish and publish the Archon catalog project. We will build a stronger integrated information organization that respects the historical traditions of information professionals and also engenders an innovative and pioneering attitude for delivering integrated information service. There has been no significant movement on this objective this year as we have not sought any additional library renovation that would allow additional staff to move there. Next Steps: This is a long-term objective and will remain a priority for additional work as appropriate and opportunity allows. 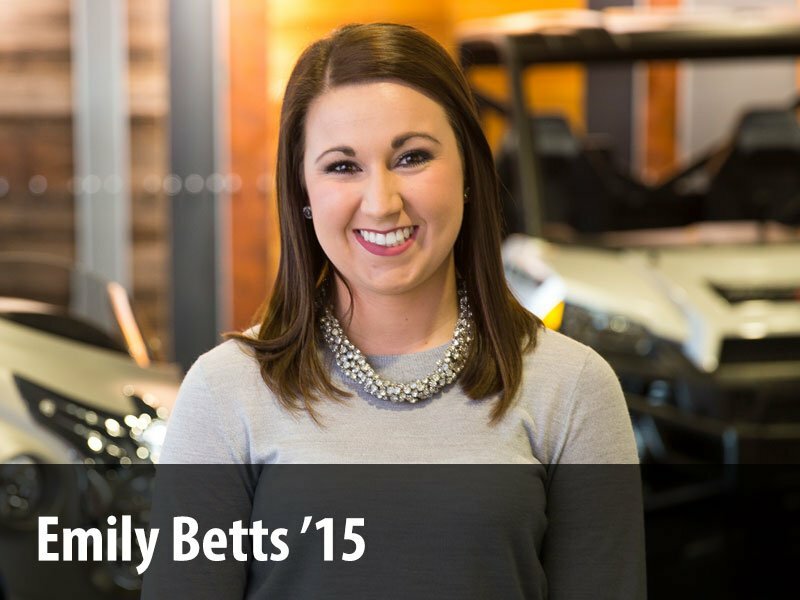 Internship coordinator Andi Beckendorf responded to six new internship inquiries in 2010-11. Most of those students are sophomores or juniors, and conversation centered on the possibilities for internships within LIS and when/how students might work an internship into their academic schedule. A music/library internship (planned two years ago) is on the schedule for January 2012. 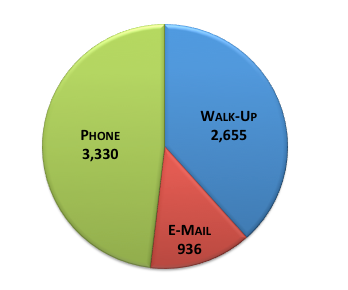 Next Steps: Follow-up contacts will be made with students in Fall 2011. Internship coordinator will meet with the new director of the Career Center who will begin Summer 2011. Each summer, the student handbooks for the Technology Help Desk and the Circulation Desk are updated. This past summer, collaboration occurred such that the two handbooks are more similar in regard to student worker policies for the two service points. In addition, a document was drafted that contains the core skills and expectations for anyone working at the Technology Help Desk, Circulation Desk, or the Research Help Desk. Student worker training in the fall and J-Term also incorporated these core skills and included conversations with the lead from each of the service points. Next Steps: Continue to identify ways in which to collaborate to improve service for the Luther community. Some work was explored on this project this year, though no significant accomplishments were completed. Additional exploration involved data export from Track-It!, though we elected to retire Track-It! at the end of the academic year. Next Steps: This continues to be a valuable initiative, though will likely wait until a new Executive Director is named. LIS has embarked on an initiative to develop a vision for the Preus Library facility for the next 20 years. The “Building Vision Planning and Framing Document” that’s been drafted is available on the LIS website at: https://www.luther.edu/lis/buildingvision/. One of the short term items that is in progress based on library planning this past year, including feedback from the Luther community, is the addition of snacks and beverage vending along with a cafe style area for gathering and conversation. The space that we’ve identified for this initiative is the grey carpeted area on the Lower Floor at the base of the main stairwell. The plan is to have this in place by the start of the Fall 2011 Semester. Next Steps: We will be soliciting feedback from the Luther community during the 2011-12 academic year as we move forward with this planning. We will seek to hire, and maintain staff with an unparalleled commitment to service, outstanding skills, and team orientation. We will work to provide opportunities for professional growth and ongoing skills development for our existing staff and celebrate exceptional achievements. We will work to support our colleagues by encouraging one another to excel and succeed. Sasha Griffin was hired as Project Cataloging Archivist and began work in December 2010. Serving on the recruiting team were: René Donlan, Ryan Gjerde, John Goodin, Diane Gossman, Jennifer Kovarik, Rachel Vagts, and Christopher Barth. This recruitment was ended by Luther without a hire. Serving on the recruiting team were: Andi Beckendorf, Kathy Buzza, Adam Forsyth, Ryan Gjerde, John Goodin, Diane Gossman, Marcia Gullickson, Lindy Moeller, Jeannette Pillsbury, Germano Streese, Rebecca Sullivan, Rachel Vagts, and Christopher Barth. Jennifer Rian was hired as Innovative Services Librarian and will begin work August 1, 2011. Serving on the recruiting team were: Andi Beckendorf, Martha Davis, Adam Forsyth, Ryan Gjerde, John Goodin, Diane Gossman, Marcia Gullickson, Lori Stanley, Rebecca Sullivan, and Christopher Barth. Andi Beckendorf serves on the Board of Trustees of the Decorah Public Library. Andi Beckendorf and Germano G. Streese presented “Seeking Wisdom in Community: Shaping a First-Year Research Experience” at the ILA/ACRL Spring Conference hosted at Central College in Pella, IA, on March 17, 2011. Ryan Gjerde presented a lightning round session, “You Got Your IT in My Library: Blending Service Points in a Merged Library/IT Organization” at the EDUCAUSE 2011 conference in Anaheim, CA on October 14, 2011. Ryan Gjerde serves as President of the Iowa Library Association/Association of Research Libraries for the 2011 calendar year,, and is a member of the ILA Editorial Committee. Ryan Gjerde was appointed to a three-year term as editor of the ACRL Information Literacy web site. Diane Gossman co-presented “Can You Picture That? Advances in Classroom Projection” for the February 2, 2011 ISIS Session held online. Matt Hammen co-presented with Rebecca Barkmeier from Carleton College on “KACE KBOX – Software Management Solution” at GusDay 2011 at Bethel University. Rebecca Sullivan serves on the Board of Trustees of the Decorah Public Library. Rebecca Sullivan serves on the Communications Committee of the College Libraries Section of the ACRL. Rebecca Sullivan compiled the CLIP Note “Web Research in Academic Libraries” published by the Association of College and Research Libraries. Rachel Vagts presented “There’s Gold in Those Boxes in the Basement: Making the Most of a Cast-Off Collection and Actually Getting to Keep the Results!” at the Society of American Archivists annual meeting in Washington, DC, August 2010. Rachel Vagts presented “The Transforming Journey, A Story of Service at Luther and Beyond” as part of the Paideia Text and Issues Lecture on Tuesday, March 29, 2011. Rachel Vagts serves as vice chair/chair election of the Society of American Archivists membership committee and is the chair of the Midwest Archives Conference 2012 Spring meeting program committee. Rachel Vagts was re-appointed by Governor Chet Culver to a three-year term on the Iowa State Historical Records Advisory Board. Much of the important work of LIS is not project-related, but ensures that the daily information support of the College is done well. Team reports representing these important support activities are included below. Much of the work of the archives this year has been in support of our NHPRC grant and supporting various Sesquicentennial related projects. Over the summer of 2010 we developed a position description, conducted a recruitment and ultimately hired Sasha Griffin as the Project Cataloging Archivist funded by our NHPRC grant. For more information about the project, please consult the Collaboration section of this annual report at https://www.luther.edu/lis/about/annualreport/2010_11/#469164 as well as the project blog at http://journeystoamerica.blogspot.com/. Related to the grant project, we also arranged for Luther College to serve as a co-sponsor of the Society of American Archivist’s “Implementing DACS in Integrated Content Management Systems: Using Archon”. Additionally, to show our support for the NHPRC during the federal budget deliberations, Sasha and Rachel wrote letters to Iowa Senators highlighting our involvement and requesting continued funding for the NHPRC and its grant programs. We also mentioned our cause to Senator Grassley during his town hall meeting in March, giving his staff fliers of information on our project and the NHPRC. Kristen Underwood conducted research in the archives with the assistance of Archives Student Worker Rachel Johnson to create the Luther College History Walk. The walk will be performed on campus numerous times during the year. Bob Larson and his Luther Sketches troupe conducted research in the archives to develop the script for their production that was performed at numerous alumni events this spring as well as several campus performances. Wilfred Bunge, Mary Hull Mohr and Dale Nimrod continued their diligent work on the Luther College history publication. In addition, we worked very closely with Greg Vanney and his Publications staff to identify and make available hundreds of photos to be included in the book. Began developing Luther College Moments in History – first shared through the LIS blog and digital sign, now available on Facebook. Expanded the Luther College Archives Facebook page. We currently have 77 fans liking the page and over 160 monthly users. We have also seen various Luther staff sharing our content to their own friends’ lists. ResourceSpace was implemented to assist in managing digital images. This project has had limited success and is being re-evaluated. A manual was developed for dealing with digital images. Luther Stories was held again during Homecoming with additional oral histories being recorded by Rachel Vagts and the student assistants. The Bear Creek Archeology collection was returned to BCA. This collection had not been accessioned and was not technically part of the Archives. Work continued slowly on the Postville Project with our partner, the University of Northern Iowa. We sponsored a screening of Luis Argueta’s abUSed documentary. We applied for and did not receive a grant from the National Endowment for the Humanities. We currently have a proposal in front of the State Historical Society of Iowa for an HRDP grant and expect notification in late June or early July. We re-evaluated the records retention schedule and made a number of updates. The policy is officially part of the college’s information safe-guarding policy. Began serving as chair of the 2012 Program Committee for the Midwest Archives Conference spring meeting in Grand Rapids, Michigan. Attended the annual Society of American Archivists meeting in Washington, DC. Served as vice chair/chair elect of the Society of American Archivists Membership committee. Member of the Society of American Archivists, Midwest Archives Conference, and the Consortium of Iowa Archivists. Our statistics are significantly higher this year due to numerous Sesquicentennial related projects. We continue to receive materials both through records transfer and donation. This year we received approximately 50 cubic feet. We continue to hold those materials during the Archon implementation. During the 2010-2011 academic year Preus Library staff included: Eddy Atwell (Public Services Coordinator), Andi Beckendorf (Research and Instruction Librarian, Associate Professor), Kathy Buzza (Interlibrary Loan Coordinator), Martha Davis (Periodicals/Serials Assistant), Jean Dickman (Acquisitions Assistant), René Donlan (Cataloging Assistant), Ryan Gjerde (Digital Initiatives Lead), John Goodin (Technical Services Librarian, Associate Professor), Lindy Moeller (Reference Librarian, Assistant Professor), Germano Streese (Reference and Instruction Librarian, Visiting Assistant Professor), Rebecca Sullivan (Academic Technology Librarian, Assistant Professor) and Rachel Vagts (College Archivist). Sasha Griffin (Project Cataloging Archivist) joined the staff during the fall semester and Jennifer Self (Public Services Specialist) was hired during the spring semester. The library was also ably staffed by over 30 student employees in the Circulation, Interlibrary Loan, Technical Services and Archives areas. Issues discussed during the course of the academic year included information literacy, budgeting, collection development, staffing, assessment, recruitments, instructional technology needs and planning, systems updates, service enhancements, issues related to TG 150, publicity and outreach ideas, and development of a summer faculty workshop. Agenda items were tracked with a rolling Google document. We instituted a chat reference feature (using Library H3lp) and continued to track Research Help Desk questions by class whenever possible. Over the course of J-Term, a suite of LISGuides was developed to support the Paideia I research unit. In conjunction with the Paideia program review, we discussed possibilities and models for continued involvement in the research and open units of Paideia I. The information contained in this section of the report focuses on the following: Paideia I, course-related instruction, outreach instruction for area schools and groups, credit-bearing courses taught by library staff, instruction for faculty and staff, and use of special collections in instruction. This was the first year we kept statistics for all training and instruction sessions in a single Google document, with each LIS staff instructor responsible for entering the relevant data through a Google form that brought together characteristics of previous library and technology reporting mechanisms. The snapshot of statistics included here focuses on sessions related to specific courses and academic work. Each section of first-year Paideia participated in two library-related research sessions, for the Fall Open Unit and the Spring Research Paper. This was the first year we had 100% participation from sections during the open unit. The selection of activities available during the open unit are best described as “library literacy” and are focused on orienting students to the collections and services. Most Paideia instructors chose a tour or a tour in combination with a research assignment related to their open unit reading. Instruction for the spring unit allowed instructors to choose two research modules (books, journal articles or primary sources) for a thirty-minute session. There were 71 Paideia I instruction sessions: 35 in the tour/orientation category, 35 in the instruction category, and one in the collections instruction category. This category includes both traditional research instruction and technology-related (multimedia) instruction oriented to Luther College students. Most of the course-related instruction was in departments with established library relationships. Several departments are worthy of note, due to increased instruction: Africana had a new faculty member; Economics & Business took advantage of technology training; HPE has developed new instruction opportunities in conjunction with their liaison; Philosophy had a new faculty member; and Religion had one faculty member who integrated research instruction into his first-year courses. Several other departments continued long-standing research sessions: for senior paper (Biology, English, Music, Nursing, Political Science), requirement for curriculum (Music, Russian Studies), or for core courses (Art, Communication Studies, Education, History, Museum Studies, Social Work, Theatre/Dance. There were 69 course-related instruction sessions: five in the tour/orientation category, 47 in the instruction category, 14 in the technology instruction category, and three in the collections instruction category. Students from six area schools came to Preus Library for research work, including art classes from Decorah and South Winneshiek high schools; the Philosophy class from MFL Mar-Mac High School; and middle school students from CMS, Ossian DeSales and St. Benedict’s for National History Day projects. Outreach instruction accounted for nine sessions that reached 133 students. Students from visiting classes were offered a 30-minute instruction session and then were given free research time to use materials accessible in and through Preus Library. Art students viewed objects from the Fine Arts Collection and participated in gallery tours given by David Kamm, Gallery Coordinator. As representatives of the LIST Department, Jane Kemp, Germano Streese, and Rebecca Sullivan each taught Paideia I discussion sections during 2010-2011. Ryan Gjerde co-taught (with Soren Steding) a Paideia II course (CyberEthics) during January 2011. There were 58 sessions for faculty and staff, 15 related to research instruction (department meeting, one-on-one consultations with faculty, etc.) and 43 related to technology instruction (ipad training, podcasting, and Power Point, etc.). The rich special collections at Preus Library are often used for resource instruction, including outreach sessions, Paideia research, and course-related instruction. This year, five sessions used the Luther College Archives and seven sessions used materials from the Rare Book Room. On occasion, courses may use more than one special collection during their class. Since the Fine Arts collection is now managed by the art historian, the only sessions that reported using that collection were related to outreach (three sessions). We do not anticipate that Fine Arts Collection statistics will appear in our report after this year. Jean Dickman ordered, tracked, received and paid for $580,737 worth of library materials during this fiscal year: $113,986 was spent on monographs, DVDs, CDs and other single items, $212,615 was spent on serials, $242,086 on electronic resources and $12,050 on academic software. In addition to ordering materials for the library collection Jean also ordered supplies, managed payments and charges for the library copy machines and kept a careful eye on the library budget. The quantity of new titles and volumes cataloged and added to our collection decreased in 2010-2011. We added 2973 titles & 3333 volumes and we withdrew 2140 titles & 2327 volumes. This resulted in a slight increase in our overall volume count. On May 31, 2011 we had 333,467 total volumes, up from 332,461 on May 31, 2010. Rene Donlan continued to provide highly accurate and timely cataloging of both new acquisitions and older items in need of more complete cataloging. We continued to enrich our catalog records with table-of-contents, jacket images and selected reviews provided by Content Café and we continued purchasing MARC catalog records from EBSCO to increase access to our online journal holdings. All of the librarians, as usual, actively participated in developing the collection. Each managed the departmental collection development allocations for our liaison departments and each contributed expertise in recommending purchases in more general areas. During the 2010/11 fiscal year we spent $242,086 on databases, electronic journals and e-book collections. This was up from $230,000 in the previous year. New electronic resources added to our collection in 2010-2011 included the CRC Handbook of Chemistry and Physics, AskART, the Oxford History of Western Music, and a number of online reference titles from the Oxford Digital Reference Shelf. In addition, we upgraded our subscriptions to America: History and Life and Historical Abstracts from citation only to the new full text versions. Finally, near the end of the spring semester we contracted with Ebrary to provide access to over 50,000 recently published ebooks from academic publishers. Looking ahead to the 2011/2012 fiscal year we continue to benefit from the superb work that Grinnell College’s Kevin Engel does on behalf of all the IPAL institutions in negotiating with several vendors for consortial discounts. Ryan Gjerde’s technical expertise was central to the reliable provision of access to our many electronic resources and his excellent work in gathering usage statistics and calculating cost-per-use amounts provided vital information for us as we faced renewal decisions. Kathy Buzza and her excellent student employees processed 6,063 ILL transactions during the year (a 4% decrease compared to 2009/10). We loaned 1596 books and sent 740 articles and we borrowed 2162 books and received 1565 copies of articles during the year. We rented 37 media items (up 32% over 2009/10) and chose to purchase 33 DVDs items that came to our attention as ILL requests. We decreased our copyright clearance costs by purchasing only 11 items at an average cost of $23.32 (total $256.50) compared to 17 items at an average cost of $35.06 in 2009-10 (total $596.00). Beginning in the 2011 spring semester we began a program of purchasing some requested items based on certain criteria designed to provide more timely service and this resulted in 71 book and DVD acquisitions. Altogether we purchased 131 items for the collection that originated as ILL requests. Our service continued to be excellent by any measure. Our average turnaround time to fill an ILL request from another library was .91 days and our time to “unfill” a request was .88 days. Our turnaround time to receive an ILL request generated by one of our patrons was 5.2 days. All three measures were improvements over last year’s already excellent performance. In addition, our document delivery service (the provision to Luther College patrons of requested articles and books that we either already have in our collections or that we acquire outside the standard ILL process) increased by 42%, from 393 items acquired last year to 556 in 2010/11. Martha Davis began to focus more this year on ensuring reliable access to our many electronic journals while she continued to order, track, check-in and claim missing issues of our print periodicals and many standing orders. She also capably managed our bindery shipments. We continued our careful transition from print to electronic journals and did not renew print subscriptions for another 26 titles in 2011. Martha also continued to manage the selection and ordering of books for our popular Leisure Reading Collection. Research help services continued to be offered at the Research Help Desk throughout the academic year. The Desk is staffed by a professional member of LIST from 11:00 a.m. to 4:30 p.m. (Monday – Friday); 6:00 p.m. – 10:00 p.m. (Monday – Thursday). On Sundays the service is provided from 12:00 p.m. – 4:30 p.m. and from 6:00 p.m. to 10:00 p.m. After 10:00 p.m. this service is provided by Eddy Atwell. Access to research help is not only limited to coming to the Research Help Desk located in Preus library. Users can also obtain research / reference help virtually by using the “Ask the Librarian” link located in the “Library Research Help” box in the library web-page. Students interact with librarians via e-mail and pose questions and, and in timely matter, receive an answer from one of the librarians. Another possibility to receive research help is to engage with librarians via the “Research Help Chat” link. Librarians staff the Chat during the time librarians are at the “Research help Desk”. During this year we continued the experience of offering Research help outside Preus Library. The buildings/spaces reached were: Center for the Arts (Andi Beckendorf); the Union (Ryan Gjerde), Koren (Lindy Moeller); Valders (John Goodin), Legends Center and Diversity Center (Germano Streese). Students and faculty who used the opportunity to engage with the librarians expressed the opinion that these experiences had a positive impact. During the academic year of 2010-2011 a total of 1941 interactions were recorded. The Rare Book Room was rearranged to better accommodate instruction sessions. This included the reupholstery of chairs that are part of the conference table set, the addition of new stackable rolling chairs (some of which were also added to the Archives Reading Room), and the installation of new electrical outlets and a projector screen. A copy of the Codex Sinaiticus was added to the Rare Book Room as the result of a donation to the collection. Sperati Guest House — 802.11n wireless coverage was added. 10/20/2010 — increased from 120Mbps to 130Mbps. 11/12/2010 — increased from 130Mbps to 140Mbps. Campus DNS service now makes use of OpenDNS. This provides us with improved phishing site protection through their PhishTank service. Our Windows domain was upgraded to a new version of Samba. Our Sympa mailing list server was retired and replaced with Google Groups. During the 2010-11 academic year, our name changed from the Application Development team to Software Development team to be more descriptive of the work that we do. The Software Development team is comprised of the following Programmer Analysts: Cindy Goede, Ben Wilbur, Lucas Welper, Jean Ryan (Programmer Analyst and Database Administrator), Steve Smith (Web Programmer Analyst), Lane Schwarz (Systems Support and Web Programmer Analyst), and Marcia Gullickson (Director of Software Development). Bob Puffer joined the Software Development team in June of 2010, transitioning from the User Services group. The Software Development team’s ongoing projects are highlighted below in addition to completing 1603 work requests to meet our user’s daily needs supporting the business and operations of the college. Operational Data Store use has expanded to over ninety custom views created to facilitate reporting via Microsoft Excel and Access, and SSRS (Microsoft SQL Server Reporting Services). We have developed the foundation for end user self reporting using SSRS by creating security and navigation structures as well as basic data models. Datatel Reporting and Operating Analytics is installed and Datatel-delivered dashboard graphs and Web Intelligence Reports have been introduced to Financial Aid, Admissions, Residence Life, and Colleague Advancement users. The Software Development team is making adjustments and working with users to evaluate usefulness of these reports and creating new reports as needed. A few software development team programmers are experimenting with the django, open source, rapid application development (RAD) language, to deliver dashboard views of information in the Datatel Operational Data Store. Training on Datatel’s new web-user interface was offered and well attended for office work groups and open sessions for casual users. Datatel’s released version 4.2 in December with major changes to the infrastructure communication between the web interface and the server. This caused performance problems and new issues discovered by our users for Datatel to resolve. Another major release is due the end of June that should resolve the critical issues and allow us to continue rolling out the web-based version to all users on campus. LIS will determine when to move users to 4.3 after testing the critical issues with hopes to have all faculty and staff using the new interface by the end of August. Residence Life and Conference Management will use cloud-based software from Symplicity (the company providing Student Life, Campus Organizations, and Career Center applications). This software will manage the occupancy in the residence halls on campus, provide new student housing registration, and continuing students an online room draw system. LIS is developing the daily data transfers for information shared between Datatel’s student information system. Both systems will enhance self-service web access for housing students based on their preferences. Moving Datatel from Unidata to MS SQL Server project is started! New servers and Microsoft SQL Server database are ordered, Datatel’s port fee and contract are signed and we have an estimate of the consulting services needed to complete the project. Project will start in June 2011 and is estimated to take 12 months. All current customizations and reports will need to be evaluated with the help of the end-users and modified as needed. For the fourth year, LIS has completed an IT audit with Baker Tilly Virchow Krause to increase security awareness and review security practices for our financial data records. Moving the Datatel system to a new server and operating system allowed us to incorporate password lockout after 5 failed attempts in addition to the 180 day password expiry to increase intruder protection. We’ve updated our software installation procedures and audit documentation in compliance with the audit review. LIS customized my.luther to allow students to update their missing person contact information and parent contact information. Employees are able to view W-2 information in PDF format for tax years 2010 and beyond. Students are able to view enrollment deposits and 1098-T forms in PDF format for tax year 2010 and beyond. Supervisors can view leave balances remaining for all of their employees. The Program Evaluation form organization and layout was improved to assist advisors and students plan to complete or change their program of study. Mahara for student eportfolio management is gaining interest. Two upgrades have taken place an another is planned for 2011SS. HPE is using Mahara for assessment in conjunction with the Katie grade book for accreditation. A comparison of functionality is currently underway between the HPE accreditation Mahara site and building a similar site on Norse Sites. Our initial exploration of pre-configured (templated) Norse Sites for ePortfolio usage is showing extremely promising signs and would place us in an open system and potentially more sustainable position with control of the API and integration with other campus systems. LIS continues to meet regularly with Publications and Communications and Marketing staff to prioritize and direct the work of the Reason content management system implementation. The majority of the college content is now in the Reason content management system with the exception of Sports and LIS. The Campus Directory is ready to deploy in the Reason system providing basic information to campus visitors and secured access to additional information for the campus community. Web event registration forms and ecommerce development increased dramatically this year, increasing revenue and giving, as well as providing the college incredible cost savings in reducing the transaction fees. From November of 2010 through May 2011, the new Reason and PayPal web forms have processed 2939 transactions, $444,606.84 in sales or gifts! The transactions fees on all these transactions ($11,064) is less than the transaction fees that Advancement Office paid in 2010 on $169,874 in gifts alone ($12,038). Online giving totals $176,575.34, for a partial year, has already surpassed last year’s total. In addition to saving transaction fees, offices are saving money on third-party form processors, and Alumni commitment to attending events is saving food costs. The Alumni office used online registration for the Minneapolis Alumni Lunch connection, Alumni auction, Sesquicentennial events in Chicago, Milwaukee, Denver, Seattle, Tuscan, Sun City, Scottsdale, Dallas, and the Luther Sketches performances. Online registration is available for sport and music camps this summer including tennis, swimming, soccer, Ultimate Frisbee, basketball, wrestling, and Dorian camps. Our summer student web programmer, Aaron Burk created a suite of applications for admissions and campus visitors, as well as current students. LIS is working to expand mobile access to course information via Katie. During the 2010-2011 academic year, the User Services team was comprised of the following eleven individuals: Edward Atwell (Public Services Coordinator), Matthew Baumann (Multimedia Lead), Robert Erickson (Classroom and Meeting Space Technology Lead), Ryan Gjerde (Digital Initiatives Lead), Diane Gossman (Director of User Services), Matthew Hammen (Workstation Support Specialist), Matt Hughes (Help Desk Lead), Todd Marken (Workstation Support Specialist), Lynnette Perry (Help Desk Specialist), Larry Sikkink (Workstation Support Lead), and Rebecca Sullivan (Instructional Technology Librarian). Effective April 18, 2011, Jennifer Self joined LIS and User Services as Public Services Specialist. She will provide circulation services on Saturdays and some weekday evenings during the academic year when Preus Library is open and classes are being held. In addition, she will open and close Preus Library on those Saturdays, manage the public services equipment, and provide research help services. Lost book titles are submitted for reorder or withdrawal in September after the summer shelf reading has been completed. These include books lost during the previous year by all borrower types and books reported missing in the course of routine business. Circulation Desk equipment circulated this year included 14 laptop computers, four netbooks, three digital cameras, one DVD/CD burner, eight external hard drives, and 13 digital video cameras. 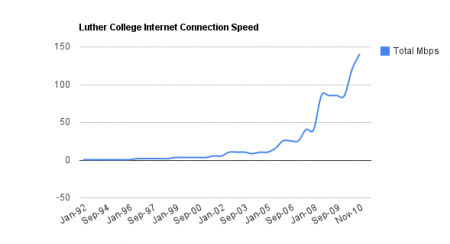 In addition, the Circulation Department was responsible for circulating modems (and adjunct pieces) for dorm room connectivity. New equipment added: two new Flip video cameras, four new heavy-duty tripods, and four new desktop mini-tripods. Also, the entire laptop pool was upgraded to Dell 630 machines. Technology Help equipment available to faculty/staff at the circulation desk includes: 13 laptops, four netbooks, four iPads, four MacBooks, LCD projectors, video screens, clickers, memory card readers, laser pointers, recording iPods, webcams, wireless mice, and wireless presenters. New equipment added: the iPads and three LCD projectors to the existing pool. Also, the entire PC laptop pool was upgraded to Dell 630 machines and two of the Macs were upgraded. Student Support Services: the circulation desk handled 30 laptops for check out to students signing contracts with SSS. LIS Events Calendar: the circulation desk now maintains an events calendar on the LIS digital sign in the library. Suggestion of the Week: the circulation desk supervisor now handles the posting of a Suggestion of the Week on the digital sign. Content is selected from comments left in the suggestion box on the circulation counter. Classroom Update: Hovde Lounge continues to be a regularly scheduled classroom/lounge primarily for usage by Preus Library building occupants. The circulation desk supervisor schedules the space outside of the classroom schedule. Student Handbook: The staff handbook for student assistants who work at the circulation desk was updated and distributed to all circulation department students at the beginning of the school year. Curriculum Library: The circulation desk supervisor maintained a listing of Elementary, Middle, and High School Textbooks held in Preus Library. Materials were added by Lindy Moeller. A major ongoing initiative is administration of the LIS website. Content creation is a responsibility shared among all members of LIS. Between June 1, 2010 and May 31, 2011, 1883 nodes have been added or modified on the LIS website, including 135 nodes created by Ryan Gjerde, Digital Initiatives Lead. Advanced functionality of the Drupal content management system is supported by the inclusion of about 100 add-on modules, requiring routine maintenance and upgrades throughout the year. A new theme, designed to match the new Luther College web theme, was introduced in October 2011. In early June 2010, LIS replaced the aging server hosting the III Millennium integrated library system, and at the same time transitioned from a turn-key license to a software only license. This upgrade allows continued compatibility with future III updates, and leverages the experience of our Network/Systems staff to lower the yearly license expense. In summer 2010, LIS began a subscription to LibGuides, a provider of hosted library resource guides. The LibGuides system, named LISGuides for its Luther installation, became the standard platform for publishing library resource guides, replacing a handful of other systems that had been used over the past 5-6 years. Andi Beckendorf and Ryan Gjerde coordinated the site theme and layout of subject guide pages. 103 guides were published over the past school year; some built from scratch and others copied from guides found in previous platforms. Throughout the 2010-2011 school year, LIS staff recorded 326 training sessions with faculty, staff and students from 58 administrative and academic departments. This summary highlights the subset of events pertaining to technology training. This chart lists the topics offered throughout the school year, followed by the total hours spent by attendees. During the summer of 2011, workstations were upgraded to new Dell OptiPlex 780s in Main 113, Main 114, Olin 202 (Computer Science Lab), and Valders 350 (Psychology Lab). In addition to this, Legends Center, Regents Center 11, and Valders 176 were all furnished with upgraded hardware. Also in Summer 2010, all podium workstations were upgraded to GX520s or better. This more powerful hardware will help to ensure better compatibility with Windows 7, which all Lab and Classroom PCs will be running beginning with the 2011-12 school year. During the summer of 2010, the workstations were upgraded for faculty in the Division of Mathematics, Science, and Physical Education as we continue our move to a staggered replacement cycle with 1/4 of the Luther faculty receiving new hardware and software each summer. This included installation of new workstations for faculty in the following departments: Biology, Chemistry, Computer Science, Environmental Studies, Health and Physical Education, Mathematics, and Physics for a total of 50 faculty, with 33 selecting a Windows workstation and 17 selecting a Macintosh workstation. Laptops were chosen by 28 faculty and desktops were chosen by 22 faculty. For more information on the faculty roll, visit https://www.luther.edu/helpdesk/services/computer-refresh/. Beginning with the 2010-11 academic year, staff computer upgrades are now on a staggered 3-year cycle. The departments are divided in thirds, and every year one third of all staff computers are refreshed. This new cycle is manageable for most needs and maximizes our hardware investments. Departments upgraded included: Admissions, Alumni, Communications & Marketing, Counseling Service, Development, Dining Services, Document Center, Health Service, Mail Center, KWLC Radio, Publications, Student Academic Support Center, and Sports Information for a total of 92 workstations upgraded. For more information on the staff roll, visit https://www.luther.edu/helpdesk/services/computer-refresh-staff/. 2010-2011 Installations – Click on Classrooms and Meetings Spaces Audio-Visual Support to view images related to these installations. Cafeteria – A major renovation of the Cafeteria was implemented during the Fall of 2010. The existing aging audio equipment was removed and was replaced with state of the art new electronics. All new speakers, audio amplifier, audio mixers, and audio zone controls were installed. A new tuner, CD deck, and a external music input were also integrated into the system. New audio additions included wireless microphones and a wireless lapel mic. The ability to plug in laptop video and audio was also placed at 3 separate locations in the dining area. Two of these locations also have 55 inch flat screen TVs at them. An eight way Extron Video Switch was also installed in the space to make A/V events more flexible. Oneota Cafe – The Oneota Cafe TV was upgraded due to faulty controls on the previous TV. Projection – We have started to install flat screen in spaces, instead of the normal LCD projectors. Commencement – Graduation and baccalaureate video transmission throughout campus went well. Satellite – We successfully changed over to a new satellite receiver for our TV5monde broadcast which is used to receive our French speaking channel for the Language department. Olin Projection – We installed all new LCD ceiling projectors in every classroom in Olin. Legends Center – We removed a very old audio system from the Legends Center and installed a new system that also allows for a microphone and external music input from iPods. All the existing speakers were checked and repaired if needed. Olin 202 – The Olin 202 remodel began and will be completed this summer. The room is being re-orientated and a new rack system and interactive white board will be installed. Olin 206 – The Olin 206 remodel was completed with the room projection being re-orientated to a new wall. Stadium Upgrades – Stadium Upgrades included new racking, audio amplifier, rack sound, and audio mixer. More work in the Olin classrooms to repair transmission paths for both audio and video, along with some new racking. Digital signage in the Jensen Lobby. Digital signage in the Koren Lobby. More cleaning and organizing of work spaces. Marty’s Cafe Audio system replacement. Oneota Cafe Audio system replacement. The major remodel of Main 114. The remodel of Koren 117. More stadium upgrades to cabling. Behind the scenes, the Technology Help Desk staff work with others in LIS to identify and plan for transitions in campus technology and the effects changes will have on users. Through individual and campus wide communications, the Help Desk provides a communication link to the campus community and LIS and creates and maintains tutorials and self-support resources for users. Work at the Technology Help Desk also provides an opportunity for professional growth among our student staff – many of whom aspire to careers in information technology. The primary method of profiling the daily work of the Technology Help Desk is through examining requests recorded in the LIS work order tracking system known as Track-It. In a typical scenario, a work order is created when a request cannot be resolved immediately. This can occur on the phone, through e-mail, or walk-up. 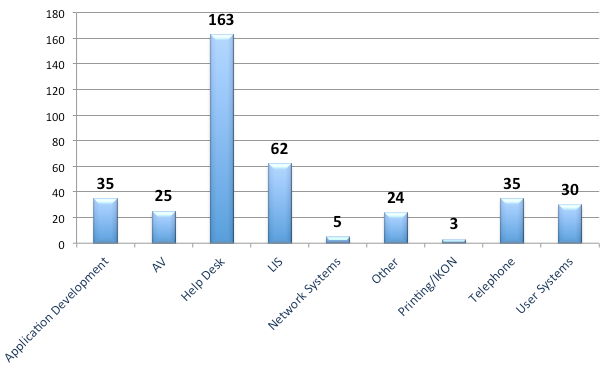 From June 1, 2010 to May 31, 2011, Technology Help Desk staff opened 3,610 work orders and closed 2,692 work orders. This represents 49% of all work orders opened in LIS (7,272) and 36% of all work orders closed (7,428). There was a decrease of work orders opened and a slight increase in work orders closed compared to the 2009 to 2010 year. However, this view of the daily work done is not as complete as one might think. The vast majority of interactions with Technology Help Desk staff are resolved immediately and not recorded in Track-It. These are considered ‘1st Call Resolutions’, i.e. – requests that are solved during the initial phone call, e-mail, or walk-up. A new tool implemented this year has greatly enhanced the ability to track these requests. 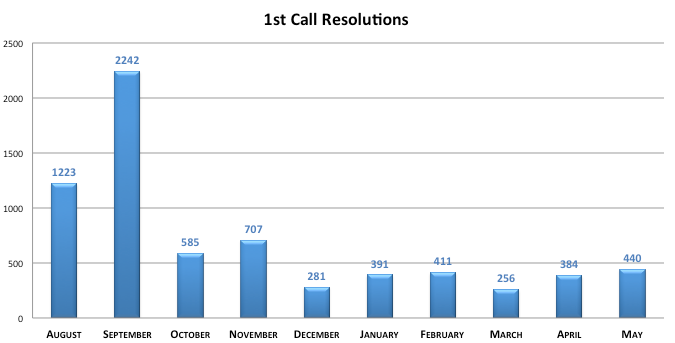 From August 2010 to May 2011, Technology Help Desk staff recorded 6,920 1st Call Resolutions. Since Spring of 2010, work orders closed generate an e-mail that is sent to the user. This notifies the user their work order is completed and also includes a link to a LIS Satisfaction Survey. How would you rate the overall service of LIS? LIS staff was polite, friendly, and helpful. Of the 7,428 work orders closed in the past year, 383 survey responses were received (a 5% response rate, on par with many surveys). Which Team Handled Your Work Order? Each spring, students working for the Technology Help Desk work with others within LIS to complete special projects. This year, a dozen students contributed to six projects by devoting 5 hours of work study each week. Projects included LIS training, classroom equipment maintenance, KBOX agent installation, updating the Help Desk website, hardware repair, and creating a video for New Student Registration. Much of the work done has had a noticeable impact in LIS and set the stage for future improvements and developments. In addition, student staff used the opportunity to expand their experience and perspective of the work done by LIS as well as form new relationships with LIS staff. 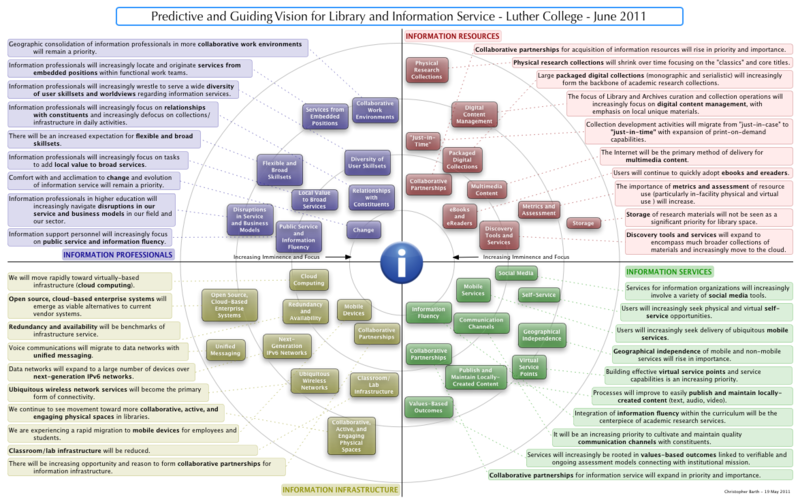 The following statements are intended to guide future vision and planning for library and information services at Luther College. Collaborative partnerships for acquisition of information resources will rise in priority and importance. Physical research collections will shrink over time focusing on the “classics” and core titles. Large packaged digital collections (monographic and serialistic) will increasingly form the backbone of academic research collections. The focus of Library and Archives curation and collection operations will increasingly focus on digital content management, with emphasis on local unique materials. Collection development activities will migrate from “just-in-case” to “just-in-time” with expansion of print-on-demand capabilities. The Internet will be the primary method of delivery for multimedia content. Users will continue to quickly adopt ebooks and ereaders. The importance of metrics and assessment of resource use (particularly in-facility physical and virtual use ) will increase. Storage of research materials will not be seen as a significant priority for library space. Discovery tools and services will expand to encompass much broader collections of materials and increasingly move to the cloud. Services for information organizations will increasingly involve a variety of social media tools. Users will increasingly seek physical and virtual self-service opportunities. Users will increasingly seek delivery of ubiquitous mobile services. Geographical independence of mobile and non-mobile services will rise in importance. Building effective virtual service points and service capabilities is an increasing priority. Processes will improve to easily publish and maintain locally-created content (text, audio, video). Integration of information fluency within the curriculum will be the centerpiece of academic research services. It will be an increasing priority to cultivate and maintain quality communication channels with constituents. Services will increasingly be rooted in values-based outcomes linked to verifiable and ongoing assessment models connecting with institutional mission. Collaborative partnerships for information service will expand. There will be increasing opportunity and reason to form collaborative partnerships for information infrastructure. Classroom/lab infrastructure will be reduced. 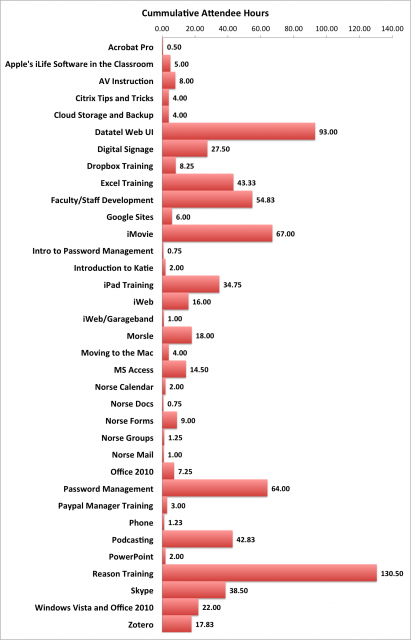 We are experiencing a rapid migration to mobile devices for employees and students. We continue to see movement toward more collaborative, active, and engaging physical spaces in libraries. Ubiquitous wireless network services will become the primary form of connectivity. Data networks will expand to a large number of devices over next-generation IPv6 networks. Voice communications will migrate to data networks with unified messaging. Redundancy and availability will be benchmarks of infrastructure service. Open source, cloud-based enterprise systems will emerge as viable alternatives to current vendor systems. We will move rapidly toward virtually-based infrastructure (cloud computing). Information support personnel will increasingly focus on public service and information fluency. Information professionals in higher education will increasingly navigate disruptions in our service and business models in our field and our sector. Comfort with and acclimation to change and evolution of information service will remain a priority. Information professionals will increasingly focus on tasks to add local value to broad services. There will be an increased expectation for flexible and broad skillsets. Information professionals will increasingly focus on relationships with constituents and increasingly defocus on collections in daily activities. Information professionals will increasing wrestle to serve the wide diversity of user skillsets and worldviews regarding information services. Information professionals will increasingly locate and originate services from embedded positions within functional work teams. Geographic consolidation of information professionals in more collaborative work environments will remain a priority.